Emily and I are huge Colleen Hoover fans, so I was more than eager to get my hands on this book. It's a little large (about 370 pages), which normally isn't a big deal, but as a college student with such a small amount of free time, I wasn't sure if I was going to be able to actually sit down and enjoy this book without having to take a million pauses to get everything done that I had to. However, I was wrong to worry about it at all, because I tore through this book so quickly that my eyes couldn't scan the pages fast enough. 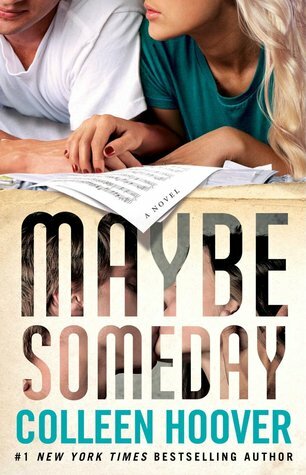 Maybe Someday had me hooked from start to finish, and every passing chapter was filled with so much love and drama and emotion (and even some heartbreak) that made me want to keep reading. There were also plenty of moments where some of the characters would throw in quips that kept me laughing -- so this book truly has everything! As the summary explains, Sydney finds out that her boyfriend is cheating on her, and her life seems to be going downhill from there. She finds herself single, homeless, fired from her job, and on top of everything, incredibly hurt and heartbroken and furious. She ends up moving in with her neighbor Ridge, who is a musician and ends up enlisting her help with writing lyrics for some songs. Before long, things between Sydney and Ridge start to change, and some incredibly important and shocking secrets are unearthed...and messiness undoubtedly follows. What I really loved about this book was the dynamic between Sydney and Ridge. There were some parts of this book that literally had me swooning and sighing out loud -- the people on the train with me weren't as enthusiastic as I was. There were some pretty classic CoHo scenes with lots of heavy, heart-racing stuff and also some sweet, adorable moments that brought tears to my eyes. This book just has so many layers and different relationship dynamics, and you learn so much more with every page that you turn. Out of all of Colleen's books that I have read, it's safe to say that this one is undoubtedly my favorite. There are some pretty big spoilers in this paragraph, so please skip to the next one if you haven't read the book yet! I was completely shocked when I found out that Ridge was deaf. He said it so point-blank that I actually gasped and went back and reread, because it was a total plot twist that I wasn't expecting. I actually really like how Colleen didn't mention it right away when Sydney first met Ridge, but ended up letting the reader know after they may have already formed some opinions about Ridge's character in their minds. I almost dropped my book with surprise at first. And as the book continued, I really enjoyed seeing how Ridge was able to be a musician while lacking arguably one of the most prominent senses when it comes to music itself. The ways he made it work, and the way he made everything with Sydney and the rest of his friends work was also incredible to see. Ridge's lack of hearing made him aware of so many other things that able-bodied people may miss -- including the sound of his own heartbeat. This book just really opened my eyes towards what it would be like to live as Ridge does and I also got to explore the dynamics of the relationships with everyone around him. I'm really glad I got that chance, and I'm incredibly grateful that Colleen gave me the chance to witness it. This was the first five-star rating I've given in quite some time, and I fully believe that this book deserves it. Maybe Someday had me hooked from start to finish, tearing through the pages and being met with sadness when I finished. However, I can happily shelve this book filled with satisfaction after the emotional rollercoaster it took me on. Easily now becoming one of my favorite books, Maybe Someday is filled with heartbreak, emotion, drama, love, laughter, overcoming boundaries, taking leaps, and everything in between. Hats off to Colleen Hoover. If this book isn't on your to-read list, I recommend that you head over right now and fix that right away. You won't be sorry!